Primary construction is stainless steel built on powdercoated steel frame with chrome-plated front leveling feet and corrosion free rear glides. Triple-redundant safety system is featued consisting of stainless steel relief valve, stainless steel splash guard and pressure activated cover looking mechanism with pressure regulator interlock. 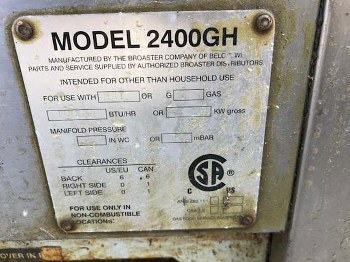 Also has single action combined pressure regulator valve/remote timer control, drain valve interlock and patented gas assist cover lift system. All ensure opertor convenience and safety. Solid state Temp-N-Time controller provides 10 programmable cooking profiles with built-in,auotamatically adjusts cooking time dependent on size and temperature of load. On-Board integrated filtration system consists of easily accessible stainless steel filter tray assembly. Powered by a 1/3 horse-power motor coupled to 5 gallon-per-minute rotary geard displacement oil pump. Fast and productive - specifically designed for high volume production, cooks up to 64 pieces of fresh bone-in chicken per load in under 10 minutes. 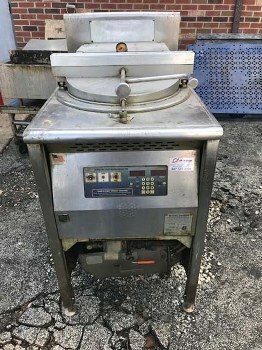 Fully welded cooking well - made from durable 300 series stainless steel. Unique auto comp feature- atuomatically adjusts cooking time to accommodate for varying sizes and temperatures of loads. 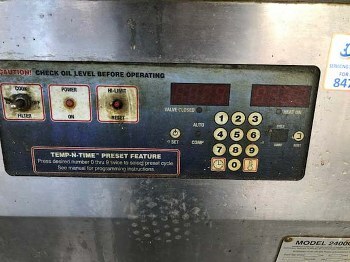 Automatic cook cycle counter - monitors production between filtering. 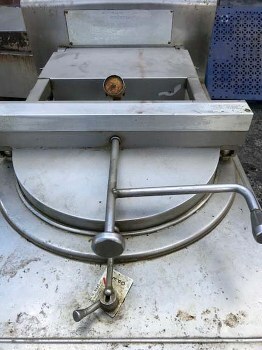 Built-in filter system - provides quick, easy, and safe cooking oil filtration; no heated fittings to disconnect.